If you want to create a leaflet to promote a new service, advertise your latest offer, drive offline traffic online, or attract fresh leads into your business, How To Write A Leaflet That Sells can help. You see while leaflets are a highly effective advertising medium, if you get your angle and your words wrong, they’re just going to hit the recycle bin. So don’t waste your budget printing leaflets that won’t work. Instead, take the time NOW to ensure your words hit the mark. Hi, I’m Georgina El Morshdy. 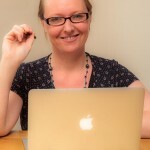 Copywriter, content strategist, and content creator at Gem Writing. 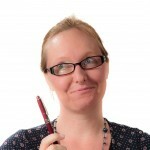 Over the years I’ve helped lots of businesses create effective copy – and I’d love to help you too. 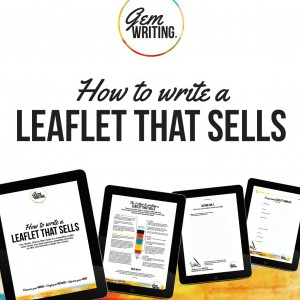 How To Write A Leaflet That Sells is a comprehensive, printed workbook that takes you step by step through the thought process needed to create compelling copy for your next leaflet campaign. Inside these chocablock pages I reveal the thought process I use when creating copy. In short, the thought-provoking questions included in this kit will help you pick the right words – and that in turn will help drive the performance of your next leaflet campaign. Just to be clear… the secret to great copy lies in the preparation and the thinking that happens before you write a single word. SO if you’re rushing words up and hoping for the best – you’re going to get disappointed! In comparison, if you take time out to think, reflect, and sort through your thoughts and ideas, then likelihood of creating something good increases. So with this step by step guide in your hand, you’ll be forced to look at your offer in a depth that you’ve previously overlooked. And the payoff? It’s very possible you’ll discover fresh insights into your product/service – even write about what you’ve got in an entirely new way. You could say that owning this guide is a little like working alongside a highly experienced copywriter – without the four-figure price tag. This 44-page workbook is in full-colur and printed on very nice paper (I have a thing about paper!) Remember, this is a printed guide, not some digital thingy so you won’t have to waste your paper and you can pop it onto your bookshelf so it’s ready and waiting for when inspiration hits. Oh, and the images above represent the actual content. An easy to follow, step by step walk through the six stages of writing a compelling leaflet. Your comprehensive, ‘write your own’ leaflet kit costs just £35 (+£3 P&P). This small investment could save endless hours of hard work and an untold amount of wasted marketing budget. So if you’re serious about crafting leaflets that get your target customers to sit up and engage with your message, invest in this kit now. It’s easy to do, simply grab your copy via PayPal by clicking the ‘buy now’ button below. Once you’ve done that I’ll send your copy by 1st class post.